Couple’s NAMES or keep “Amazing” and “Couple” or Delete. Hang it on the wall when you are not serving each other or your guest. Spoil yourselves with breakfast in bed. Bring coffee, tea and cookies to your family and friends on your beautiful sapphire anniversary gifts. Beautiful 45th wedding anniversary gift is so practical too. Serve yourselves in bed, carry small items from room to room and serve coffee to your friends. When not in use, hang it on the wall. Lovely anniversary wall art. 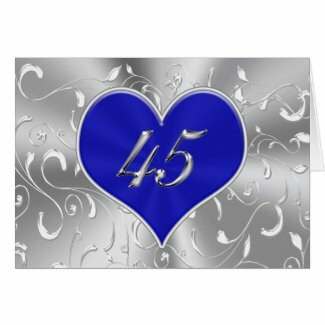 It will be even more memorale What is the traditional 45th wedding anniversary symbol? 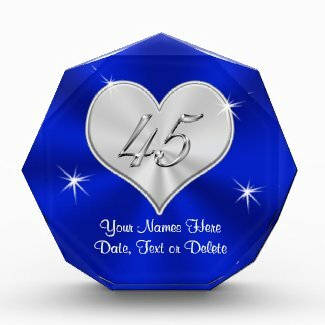 Sapphire is the 45th anniversary gem. When preparing for your forty fifth anniversary party, first decide on a theme. Sapphire blue decorations will symbolize this wonderful event. Personalizing some of the 45th decorations, party favors and couple’s gifts will make it just that much more special. Everyone loves seeing their names on gifts. You can type in any text, date or special message to the couple. If you don’t see what you are looking for, Call Linda. I can make changes to any of my designs. Add text, photos, change colors, etc. My mom and dad were married 45 years. Those years were filled with so much love and affection. The legacy their marriage left with us will go on forever in our hearts. My dad is forever in my mom’s heart. This article is dedicated to my wonderful mom and loving dad. Thank you both for teaching us to Love the Lord and how to Love our Spouses. I love you both so much and am so grateful to be raised by such wonderful parents. Even though technically my dad is my step father, he is as real of a dad as anyone could ever be. 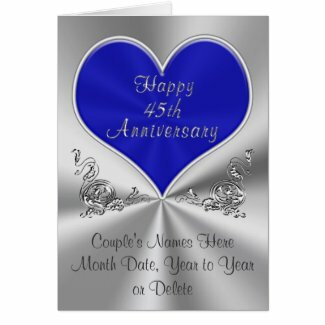 We have many more Personalized 45th Anniversary Cards and Presents. 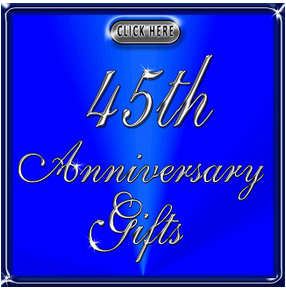 Thank you so much for visiting our 45th wedding anniversary gifts for parents. Great gifts for your grandparents, friends and your family. Give me a call to create an anniversary gift for your anniversary year. I can make it in your choice of colors. Thank you for stopping by and shopping with Little Linda Pinda. 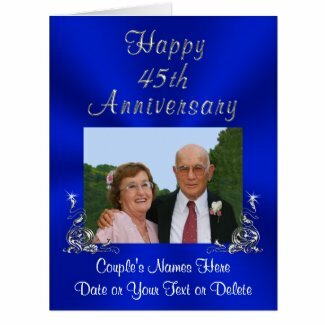 I hope you enjoyed my Blue Sapphire Wedding Anniversary Cards and 45th Wedding Anniversary Gifts on Zazzle products. Quality and Brilliantly printed. 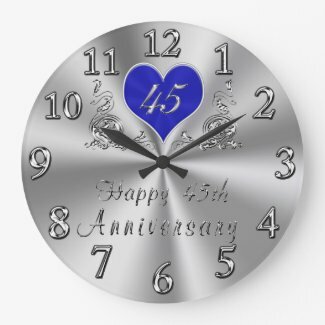 I can create these gifts for any year anniversary in any color and add the anniversary symbol, when available.